We are a family owned and operated company which has been distributing Akubra hats here in the North America since 1965. We have an efficient no-frills organization to give reliable, prompt stock service. All our Akubra styles are held in depth in our Bothell, Washington warehouse. An overview of the styles available through our stock service in North America is given in our Style Guide (pdf). Each stock service style is described in detail online. Those retailers taking full advantage of our in-stock service are selling a wide range of styles from very lean and efficient inventories. Our Hat Accessories including braided kangaroo hat bands and chin straps, only available to our Akubra accounts, make excellent add-on sales and lead to increased customer satisfaction. Akubra makes more than 70 styles of hat. If you are interested in a style we do not stock, please contact us for details about our Akubra indent program. We can import for you most Akubras given a four months lead time. Minimum quantity and other restrictions do apply. If you have a retail store that could carry Akubra hats well, please contact us at 1-800-324-4934. We are open from 9:00 a.m. to 5 p.m. Pacific Time, Monday through Friday, closed major holidays. You can reach us by Email at inquiry@akubra-usa.com. Our fax number is (425) 486-0224. 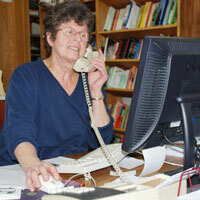 If calling from Canada or the greater Seattle area, our telephone number is (425) 485-2132. Akubra is the only major hat company making fur felt hats from start to finish. It takes between 3 and 5 months from when we place our orders to receiving the hats in Bothell, Washington. We place large orders every month. Our large orders ensure that we get the best air freight rates and are able to keep our wholesale pricess as low as possible. Akubra notifies us once the order is shipped, usually 2-1/2 to 4 months after our order is placed. We then monitor the shipments progress into the US. We pay all duty and custom clearance fees. In addition, we need a Fish & Wildlife permit to import the pure fur felt hats. We pay the annual fee for this permit, and make sure the paperwork is in order. 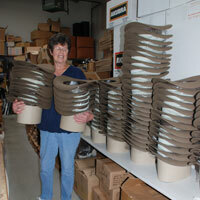 It's all hands on deck when a shipment from Akubra arrives! Akubra ships hats to us nested 12 or so to a box, two boxes further protected in a tie, to minimize freight charges. We unpack the hats, checking that the hats were not damaged during transit and are as ordered. 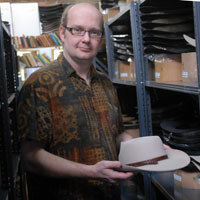 Akubra has excellent quality control, and remove hats not meeting their high standards from our orders. We minimize the effect of such short shipments through our in-depth inventory and frequent orders. Occasionally a hat is treated roughly during shipment. We steam or otherwise renovate such hats before receiving it into our inventory. If the hat cannot be brought back to it's original condition, we reject it, ensuring that our customers receive the finest quality hats as expected. We offer offer stock service of our most popular styles of hats. Our minimum order is just 5 hats (assorted styles, sizes and colors), allowing our dealers to keep their inventory levels low yet offer a range of styles. Wholesale orders are generally shipped within 48 hours of receiving your order, with the hats nested to minimize your shipping costs. Our new lines and low sales volume hat styles are offered on a limited stock service basis. Most small orders can be filled, but we do not carry sufficient inventory to fill large or unexpected orders. Please contact us early if you anticipate a special promotion requiring large numbers of one of these styles. If you have any questions or concerns, give us a call or drop us an email. We can recommend styles for your particular store or shop, and work with you if you have a special promotion. We are open from 9 am to 5 pm Monday through Friday, Pacific Time, closed major holidays. Wholesale orders are generally shipped within 48 hours, with shipments leaving Bothell Tuesday through Friday.